Three nights ago, my cousin’s (Dominic – the one I said tends to go running when he gets drunk and fell into some cactus a while back) girlfriend died of an overdose. He’s known her since he was 6 years old and he’s now 21. He’d been trying to get her to stop hanging out at her friend’s house, who was into heavier drugs, because he was scared for her. But he got a call two mornings ago, after spending the night worried because she hadn’t come home. She died in her sleep at the friend’s house after taking several different kinds of drugs. My cousin is a really sensitive guy who was totally in love with this girl and was ready to settle down with her, buy a house, and do the whole happily ever after thing when she was still in the having-fun stage of her life and not ready for settling down. So I went over to spend the day with him Sunday at my uncle’s house. He didn’t want to talk, so his sister (Meagan) and I just sat with him on his bed in his room and watched stupid movies all day and into the night. I don’t like to drink, but the two of them do, so they slowly polished off a bottle of Jack and several of those big Michelob Ultras. By the time the sun went down, he was ready to talk a bit, but he also wanted human contact, so we dogpiled on him and continued watching movies while he reminisced about his girlfriend, who was also a good friend of Meagan’s. We got hungry, so Marissa (their mom and my uncle’s wife) ran over to the grocery store and bought a bunch of junk food for us. I figured what the hell and pigged out with the two of them. They’re the type of people who can eat nothing but junk food every day and never have any stomach/body issues and never gain weight. We ended up falling asleep in a pile on his bed. The next morning I woke up to joint pain that was so bad I could barely move. I had no idea what was wrong, but the fact that my stomach was also really not doing well had me picking through the discarded junk food packages on the floor. Yup, the bag of chips I single-handedly finished was made with corn starch. I’ve never had such a bad reaction to corn. Usually I’ll get a bad stomach ache and just throw it up, but I’ve been very careful over the last year and a half to stay completely away from corn products. I used to just kinda stay away from them, so I think my reaction was a lot more severe after having had no exposure to it for so long. I couldn’t straighten my arms or legs all the way or bend them all the way. My left hand and right elbow in particular hurt so much that I couldn’t do much of anything, so Meagan drove me home (only two blocks away). I took some ibuprofen and went to bed. Today only my right elbow is a little sore, and even though it hurts, I can bend and straighten it. I’ve decided to seriously stay away from corn products. That wasn’t worth it. Dominic was doing a little better today, but I’m sure it’ll take a while. A year and a half ago his best friend committed suicide and just six months ago his brother’s adoptive father (who was a super nice guy and had become close with all three kids) committed suicide too. It’s been a rough couple years for Dominic. He designed his own memorial tattoo for the friend (it covers his right upper arm), and he’s already talking about what he’s going to do as a memorial for his girlfriend. The funeral is going to be in two days, and my whole family is going. WHAT. I can’t tell you how many times I’ve heard some version of this awful story. 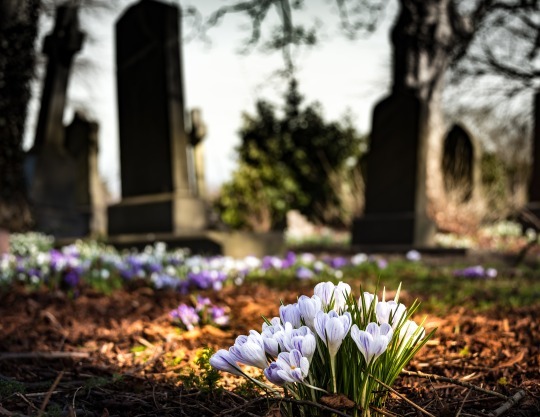 Stop taking people with dementia to the cemetery. Seriously. I cringe every single time someone tells me about their “plan” to remind a loved one that their loved one is dead. I also hear this a lot: “I keep reminding mom that her sister is dead, and sometimes she recalls it once I’ve said it.” That’s still not a good thing. Why are we trying to force people to remember that their loved ones have passed away? If your loved one with dementia has lost track of their timeline, and forgotten that a loved one is dead, don’t remind them. What’s the point of reintroducing that kind of pain? Here’s the thing: they will forget again, and they will ask again. You’re never, ever, ever, going to “convince” them of something permanently. People like the answer that they gave you. Also, it takes you off the hook to “come up with something” that satisfies them. Then, twenty minutes later, when they ask where mom is, repeat what they originally told you. I support this sentiment. Repeatedly reminding someone with faulty memory that a loved one has died isn’t a kindness, it’s a cruelty. They have to relieve the loss every time, even if they don’t remember the grief 15 minutes later. In other words, don’t try to impose your timeline on them in order to make yourself feel better. Correcting an afflicted dementia patient will not cure them. They won’t magically return to your ‘real world’. No matter how much you might want them to. It’s a kindness of old age, forgetting. Life can be very painful. Don’t be the one ripping off the bandage every single time. My grandfather had dementia for about two years before he died. His wife died within that first six months of that dementia, and he forgot, so we just let him. He’d talk about things they did like it was recent and would talk about things they were going to do in the future. The few times he asked where she was, we just said she was busy, and he would smile and go on about his day without the trauma of reliving his wife dying. Let people with dementia talk about their dead loved ones without shoving the fact they’re dead in their face. It’s cruel and there’s no good reason for it. He died much happier than his sister. HIs sister’s children made it their mission to constantly remind her that her husband was dead, and she was miserable ALL THE TIME until she died. I used to work for emergency rooms across the country, and it always amazed me that there was no in between. One night we got someone in who was pulled from a vehicle so severely damaged the paramedics couldn’t identify what make and model it was, and the person walked away without a scratch. In the same evening we got a woman who was walking to dinner with her family, tripped on a crack in the pavement, hit the ground just right, and was permanently paralyzed from the neck down. Just after that we got a happily married mother of five who was on her way to pick up her kids, was hit at a very low rate of speed, and her SUV rolled only one time, but she hit her head just right on the side window and died of a brain bleed after appearing fine all the way to the hospital. All of those people were in their late 20s and were healthy before that night. My cousin Robyn died last August, and I hadn’t really thought of her much in the last couple months, but it hit me again today when I didn’t get a Pi Day joke from anyone. Robyn was into geeky things like me, and every year on March 14th I could expect something wacky and goofy involving pi and puns sent to me via email from her. She would also post a selfie wearing her Pi Day t-shirt and grinning like an idiot.